We are Firmly Founded. And Proudly Growing with over 4,000 members from across the globe. What to Study or Degree to get for Robotics? Join our club on Yahoo! We truly have a great mix of members, from newbies to pros! Over 4000 members from across the world! My name is Justin Ratliff. Thank you for visiting TRCY, The Robotics Club of Yahoo, which is open to anyone with an interest in robotics. Simply go to our Yahoo club site, create a user name and password. The Robotics Club of Yahoo is a moderated group. All message from new members must be approve for posting by a group moderator. SPAM and other unwanted posting will be deleted and members posting in-appropriate content to the group will be removed. Please remember to keep conversations civil. Its ok to not like other people's ideas but disagreements should be respectful. Name calling will not be allowed. If you feel your messages are taking to long to post, please send me an e-mail with your Yahoo ID. I hope you'll find a home in our group. Want to learn how to build your own robot? 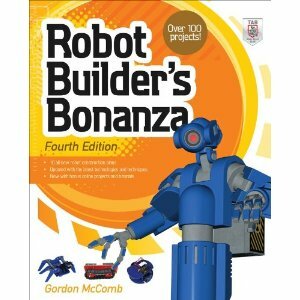 Then you need Robot Builder's Bonanza: 4th Edition by, TRCY member Gordon McComb. It's like the bible for robot builders! Gordon McComb's articles can also be found in Nuts & Volts and Servo magazine! Long time TRCY member Dennis Clark also has written a couple of books to share is knowledge and is also the Answer Man in Servo magazine! 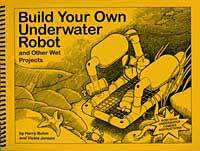 Build Your Own Underware Robot is one of the best books on the subject. Here is a quick list of tools every robot builder should have if you want to be able to create, repair and debug any robotic creations. For a complete list download the Tools .pdf which includes in-depth details and pictures. The most important tools is a Multimeter. I recommend a digital multimeter. There is no need to buy an expensive meter, some of which can cost as much as $399 for advanced meters from Fluke. You can get a cheap digital meter from Jameco or Circuit Specialists for $9.99-$13. This will allow you to take a wide range of DC and AC voltage/current, read resistance, check diodes, check transistors and capacitance. You'll also want to buy a set of alligator test leads, which you can find at Radio Shack. Radio Shack has a set of fully insulated alligator clip adapters for test leads. The item number is 270-354A. I highly recommend them! The next must have tool is a good Soldering Iron. You can buy a cheap soldering iron for $10 or less from Wal-Mart or Radio Shack, but I would order a decent Weiler adjustable temperature model for around $50 from Jameco. You'll also need solder, I like the sort from Radio Shack the best. It's also not a bad idea to go ahead and buy a replacement tip and solder sucker. You can get a solder sucker from Radio Shack for less then $10, it'll help with any goof ups. You'll need a solder-less Breadboard for experimenting. This is a socket board will allows you to pop in components to test out your circuit ideas. You'll also want to get a set of jumper wires. You can find these at your local Radio Shack but you'll end up spending twice as much. Circuit Specialist have breadboard and jumper wires sets starting at around $10, which is a great value! Next on my list of must have tools are a good set of Screw Drivers. You should own a set of jewelers screwdrivers, which are smaller sized and good for taking apart most smaller electronics. You can get a set from Wal-Mart for less than $5. You should also own a 4-in-1 screwdriver, which lets you switch out between Phillips and slotted driver bits with ease. Wire strippers and Pliers. You should have good wire strippers! For pliers you should have a set that includes: wrench style, needle nose, and wire cutters. You can pick up a set like this from Wal-Mart for around $10. Misc. tools: A wide selection of tape including masking, duct and electrical tape! A selection of wire nuts: small, medium and large. A selection of wire ties: small, medium and large. (Tie down your loose wires, you'll be glad you did!) Small and larger scissors. On the TRCY message boards we often see questions about what should be studied or what degree should be pursued to have a career in the robotics field. Currently there are not many schools which offer a pure robotics degree. The study of robotics involves just about everything under the sun. Robotics is the art of duplicating functions or tasks that a human would do. To do that you need to understand: mechanics, electronics, computer design, programmable logic, software programming and the philosophy of cognitive science. To answer the question of what you should study to learn robotics I recommend you first ask your self what you like to do? If you like working with your hands and staying active a degree in mechanical or electrical engineering would suit you better. If you like to sit for hours on end solving problems when a degree in computer science or programming architect might be better for you. In either case keep an open mind when it comes to your career choices, because currently there are not many jobs in the robotics field, and most of them are currently for the service of industrial robotic arms. If studying robotics on your own as a hobby starting with a robot kit is a great way to start. Our club was listed in the April 2007 issue of Servo Magazine as one of key online robotics club in Gordon McComb's column "Robotics Resources". We made it into SERVO Magazine June 2004. 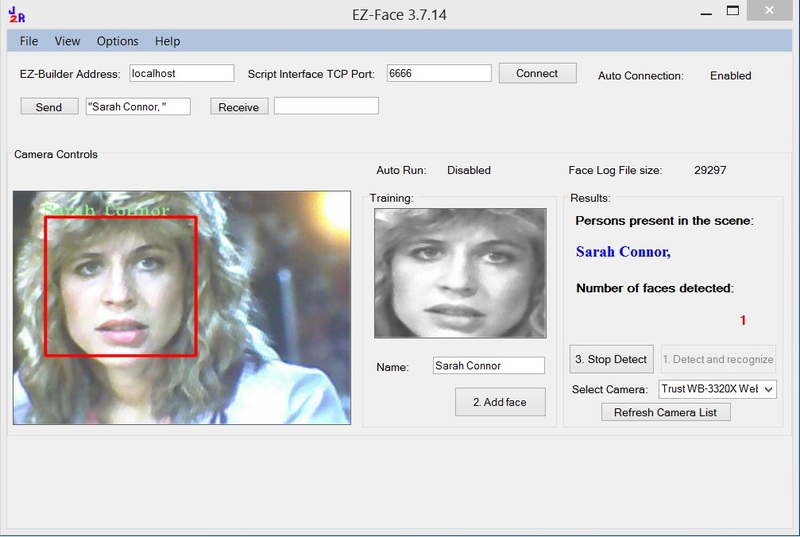 In Gordon McComb's Robotics Resources you'll find TRCY listed. Thanks Gordon for the great write up! Gordon McComb is as everyone should know the author of Robot Builders Bonanza 1st, 2nd and 4th editions and co-author of the 3rd edition as well as the owner of Budget Robotics. We now have our own domain name. You can reach this website buy typing TRCY.org into any browser. This making linking to use much easier! The TRCY Fighter Bots was listed as a "go to" site in Gordon McComb's Robotics Workshop article in Popular Electronics Nov 1999, way to go TRCY members! We have also been listed in the reference section of his new book, Robot Builder Bonanza: Second Edition.